I had a very enjoyable time on my last trip to Tallinn, Estonia. The Estonians are nice, welcoming people. I went to the Olde Hansa pub. Tallinn was part of the trading alliance of Northern European cities called the Hanseatic League, which stretched along the Baltic coast of Europe from London to Novgorod in Russia via cities such as Hamburg and Riga. King's Lynn in Norfolk retains a Hanseatic warehouse (below). Intrigued by the history, I've been targeting some of the dominant Hanseatic cities for visits. Tallinn is still very proud of this connection. Maybe it's due a comeback? Anyway, hence the name of the pub, Olde Hansa. A fun place. A medieval-theme pushed to the limit, but a nice ambiance and great music - if you like early music. The cheery-faced musicians will play Greensleeves if you ask them. Sitting on chairs draped in animal skins, very pleasing spiced wines are served in earthenware pots. Seeking authenticity, the medieval menu has no potato, as potato hadn't arrived in Europe in the time they are recreating. Most dishes are served with spelt. Bear was on the menu went I visited. A nice spot to read a Commando comic you might think. And you would be right. 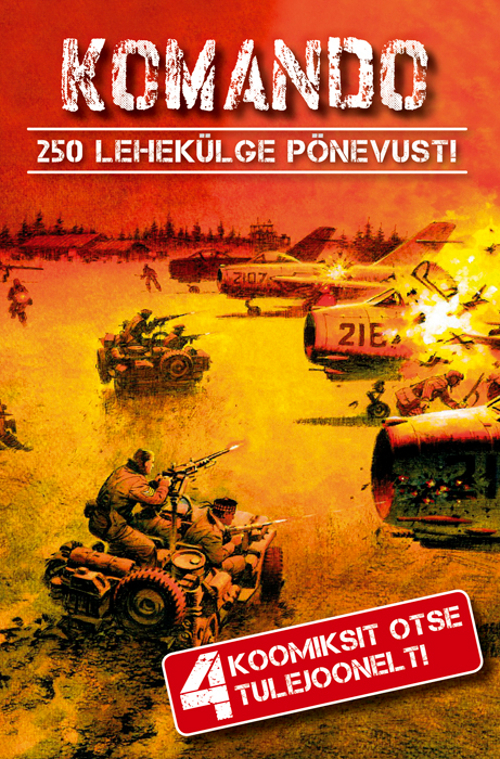 And now your Estonian-speaking friends can do just the same, as Commando has released a four story collection in Estonian.